I love black beans, and they're really good for me, but sometimes I get tired of them. 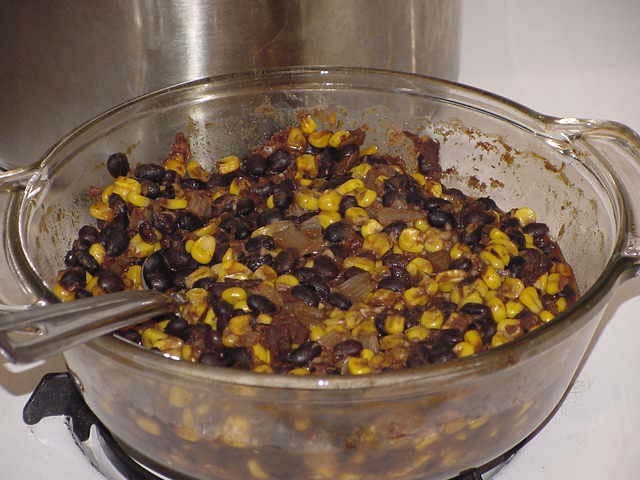 Most of the black beans I make have the same basic ingredients—cumin, cilantro, lime, and tomatoes. It's time for a change, baby! So I browsed through some cookbooks and went online. Apparently, I'm not the only one who's black bean challenged. Most recipes I found had pretty much the same ingredients I use. Not that there's anything wrong with that, but a gal wants a little variation in her beans, right? I don't know what made me think of baked beans. Lord knows I've never made them. For the most part, my only experience with them was doctored van Camp's Pork and Beans (dried onion flakes, ketchup, brown sugar, a dash of Worcestershire—YUM!). I didn't even know if black beans could be baked. So I narrowed my search and found a couple of recipes that looked interesting. I didn't have all of the ingredients on hand for either of them, but I had enough to experiment. And came up with my first ever baked black beans. And you know what? I love beans baked. They have a completely different taste and consistency to stovetop beans. The sauce is thick and rich; the beans are smooth and creamy. I added the corn to round out the proteins, but it would be just as good without it, I think. My first attempt was really good, but it could be better. I'm going to play with this until I get it right. Here's what I used this time: Canola oil, onions, garlic, black beans, corn, sun-dried tomatotes (completely wasted as far as I can tell), tomato sauce, honey, chili powder, tarragon, bay leaves, and smoked paprika. As much as I love garlic, I think I'll leave that out next time, and I want to tweak the spices. It had a mild BBQ flavor that I want to enhance. I think I'm going to be baking a lot of beans in the future. And I think Boston Baked Beans might just be next over the horizon. If you find a really good BBQ baked beans recipes let me know, I love them and have never made them.